Where to watch, when to watch and what to wear on your eyes for the eclipse Monday. At 2:44 p.m., it'll be at its maximum coverage (about 70 percent to 75 percent), and the partial eclipse will end at 4 p.m.
On Monday, August 21, hundreds of millions of people will get a chance to view the first total solar eclipse visible from the contiguous United States in nearly 40 years. Here are some of the most asked questions about the historic event. 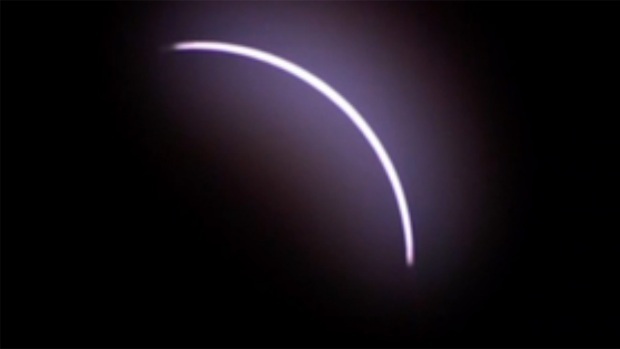 What’s the gist of Monday's solar eclipse? Fourteen states are in the path of totality, called “umbra.” The New York region will be experiencing a partial eclipse, or “penumbra.” You can see a partial eclipse, where the moon covers only a part of the sun, anywhere in North America. To see a total eclipse, where the moon fully covers the sun for a short few minutes, you must be in the path of totality. The path of totality is a relatively thin ribbon — around 70 miles wide — that will cross the United States from West to East. When and where will the eclipse be viewable? The first point of contact will be at Lincoln Beach, Oregon, at 12:05 p.m. EDT. Totality begins there at 1:16 p.m. EDT. Over the next hour and a half, the eclipse will cross through Oregon, Idaho, Wyoming, Montana, Nebraska, Iowa, Kansas, Missouri, Illinois, Kentucky, Tennessee, Georgia, and North and South Carolina. The total eclipse will end near Charleston, South Carolina, at 2:48 p.m. EDT. From there the lunar shadow leaves the United States at 4:09 EDT. Its longest duration will be near Carbondale, Illinois, where the sun will be completely covered for two minutes and 40 seconds. How many people will be able to see the eclipse? An estimated 500 million people will be able to observe the total solar eclipse, in partial or total form: 391 million in the United States; 35 million in Canada; 119 million in Mexico; it will also be viewable in Central America, parts of South America and northwestern Europe. When was the last total eclipse in the continental United States, and when is the next one after this year's? The last time the contiguous United States saw a total eclipse was in February 1979. The next one is in April 2024. Driving while the total solar eclipse is happening on August 21? Here are seven tips that will ensure your safety while driving. Who is capturing the eclipse? Eleven spacecraft, at least three NASA aircraft, more than 50 high-altitude balloons, and the astronauts aboard the International Space Station are all offering a unique vantage point for the celestial event. Where can I get special glasses to view the eclipse with? A number of retail chains are selling official eclipse eyewear; among them are: 7-Eleven, Best Buy, Bi-Mart, Casey’s General Store, Circle K, Hobby Town, Kirklands, Kroger, London Drugs, Love’s Travel Stops, Lowe’s, Maverik, Pilot/Flying J, Toys “R” Us, and Walmart. Libraries across the country are also giving away free eclipse glasses with support from NASA, Google, the Gordon and Betty Moore Foundation, and the Space Science Institute’s STAR_Net initiative. More than 2 million ISO-compliant solar eclipse glasses have been handed out to more than 6,900 libraries. To find out which libraries are holding eclipse-related events and distributing the free glasses, see the library map on the STAR_Net website. Are there any basic safety tips while watching the eclipse? Eclipse glasses are an essential tool, but unfortunately some aren't safe to use, so you shouldn't use any eclipse glasses that haven't been verified as safe or properly certified (Amazon has recalled some). Make sure the certified glasses you’re using haven’t been damaged. 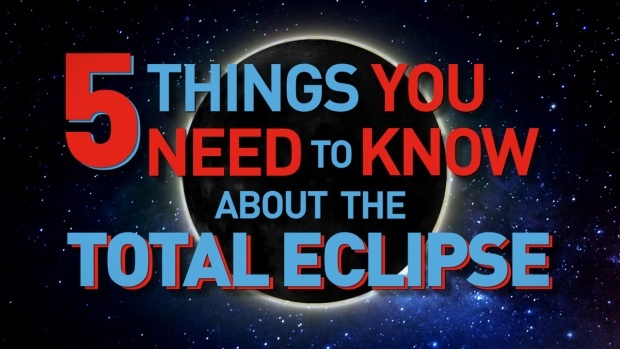 It's also important not to look at the eclipse with regular sunglasses or unfiltered binoculars, through a reflection, or through clouds or fog. Phones and cameras need special solar filters or the eclipse could damage their lenses. What are other ways to view the eclipse? Trees with a lot of leaves will project the eclipse onto the ground. It’s one way you can view the eclipse without special glasses. Come Monday, eyes will be on the sky to witness a rare solar eclipse. 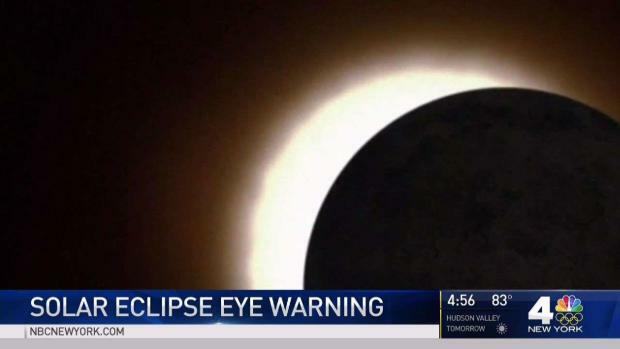 In the tri-state, it won't be a total eclipse but people could still be risking their vision. Roseanne Colletti has more. When is the best time to view Monday’s eclipse? In the greater New York area, the eclipse begins at 1:23 p.m. on Monday, August 21, according to Andrew Yolleck, a STEM educator at Liberty Science Center in Jersey City. This is when the moon starts passing over the sun. Maximum eclipse will occur at about 2:44 p.m. and that’s the time to best view the eclipse. It’s also when it will be darkest outside. The moon will slowly move off of the sun after that, with the eclipse ending at 4 p.m. As of Friday, the weather looks good for viewing, with mostly clear skies in the forecast for the New York area. 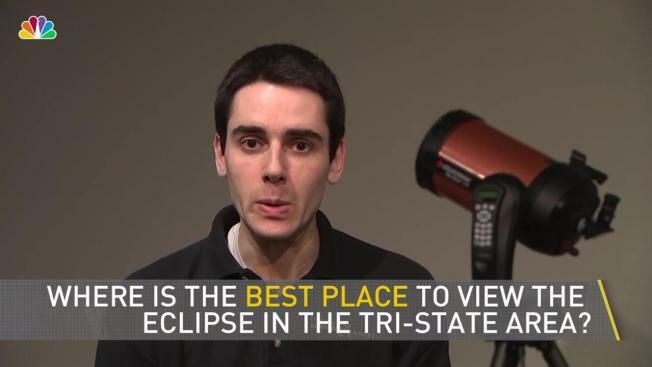 Where is the best place to view the eclipse in the tri-state? How dark will these areas get? Areas further south in the tri-state will get the best view. The southern tip of New Jersey, near Cape May, will see the moon covering 75 to 85 percent of the sun since the area is closest to the path of totality, which is cutting through the Southern states. How Old Will You Be for the Next Total Solar Eclipse? Areas closer to New York City will see about 71 percent of the moon covering the sun, according to Yolleck. During maximum eclipse, it will be darkest in the areas further south. In areas in the path of totality, it will be as dark as night for a couple of minutes. In the New York City area it will still be light outside, although somewhat darker. Here are some places to catch a glimpse of the eclipse in the tri-state area. A total solar eclipse is going to be visible across parts of the U.S. this August. But what is a total solar eclipse, exactly? When was the last time one happened? What should you look for? Find out all that and more. Will the 2024 eclipse be visible in the New York region? The next total solar eclipse will be great for East Coasters. While people in the New York area will see about 70 to 75 percent of the sun covered on Monday, it will be even more than that in 2024. What’s more, the path of totality — where viewing of the eclipse is most optimal — will be closer to the tri-state area. People who travel Upstate or to cities like Buffalo will get a near-optimal view of the eclipse, according to Yolleck. And those willing to head near the United States-Canada border, to places like Burlington, Vermont, will enter the path of totality.